The world has been utterly transformed by artificial refrigeration. 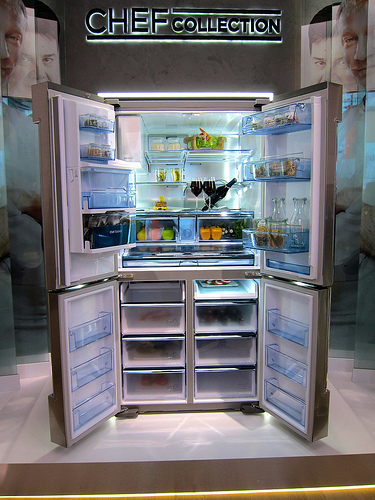 There is now a fridge in a freezer in just about every home, and a very large number of business premises as well. Refrigeration technology dates back as far as 1755 – much, much longer if you count icehouses which have been used for thousands of years. However, it is only in the last century or so that artificial refrigeration has really taken off. Nonetheless, this technology has become a simple fact of life and very few people understand how their freezer actually manages to freeze. Even the briefest look at the website of a retailer such as Fridge Freezer Direct will reveal a dizzying array of fridges and freezers, from simple bottle coolers to massive commercial freezers. However, on varying scales they all use the same technology as the freezer in your home. Evaporation has a cooling effect. You have no doubt noticed how stepping out of the shower or emerging from a swimming pool makes you cold until you have dried off – even on a fairly warm day. This is because when a liquid evaporates, it absorbs heat. The water evaporating from your skin is absorbing your body heat and cooling you down. Freezers use the same principle, but on a much bigger scale. Liquid is evaporated into gas, absorbing heat in the process, in order to reduce the temperature of the freezer’s interior. Through technology, however, it is able to take place on a much bigger scale even in the fairly small confines of your freezer’s inner workings. As a result, it doesn’t just make your food slightly chilly like a person stepping out of the shower but freezes it solid. A freezer starts not with water but with something that would usually be a gas at room temperature. Various gases have been used over the years. The first gases used were toxic, but when safe alternatives were created these naturally took over. When it was discovered that these alternatives, though safe for people, were bad for the environment, still other gases were found to replace those. Today, the most common is tetrafluoroethane. A compressor is used to compress this gas down to high pressure, which forces it to turn into a liquid. This is the opposite of evaporation and has the opposite effect; releasing heat and raising the temperature of the surrounding environment. However, this takes place in a part of your freezer’s system that is designed to radiate almost all of this heat outwards through the back of the freezer rather than inside. After this, the liquid is released through an evaporator. It turns quickly back into a gas, absorbing heat and making the surrounding area colder. The evaporator is designed and located so that the vast majority of the cooling effect takes place inside the freezer. Just like evaporating water, this has a cooling effect, but unlike water this effect is powerful enough to bring temperatures below zero. The gas then cycles around and is compressed again, releasing the heat absorbed on the outside of the fridge in a continuous process of cooling. Next story What Is Exactly Meant By Reincarnation?